Two major features incorporated into the design of Vecoplan shredders make them perfect for all three applications. First is the ability to determine the size of shredded output, via inexpensive industrial screens that are quickly and easily changed. Second is a Vecoplan shredder’s universal ability to process virtually any material. For secure destruction of textiles, Vecoplan’s controllable particle size means that you can shred counterfeits, defective merchandise, prototypes, overruns, etc., down to any particle size you want, eliminating even labels. A Vecoplan shredder’s universal processing ability means that you can shred natural and synthetic fibers, buttons, zippers, snaps, grommets, leather, plastics, and rubber, as well as other secondary materials that are incorporated into clothing, hats, shoes, and other products manufactured from textiles. For recycling, or put more aptly reclamation of fiber from textiles like shredded fabric, controllable particle size means you can shred and still maintain the fiber length necessary for the manufacture of new products from the reclaimed fiber. Vecoplan’s universal shredding capability means you can shred not only natural fibers, but with Vecoplan’s patented SureCut™ film and fiber rotor, even synthetic fibers that tend to self feed, wrap and sometimes melt on traditional shredder rotors. For producing PEF (Process Engineered Fuel) from textiles, or waste streams with significant volumes of textiles, Vecoplan’s controllable particle size means that you can select the best size of shredded material for the next step in the processing system whether it is screening, separation or feeding to a boiler, furnace or kiln. 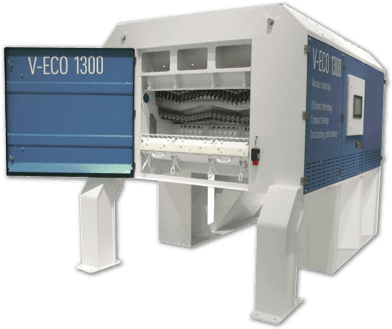 A Vecoplan fabric shredder’s universal processing ability means that you can shred textiles made from natural or synthetic fibers including carpet and virtually any other material that might be in a single waste stream. Contact Vecoplan with specific information on your special textile application. Engineers will assess and evaluate this information, conduct feasibility studies, and provide you with data on the best solution to achieve your goals.